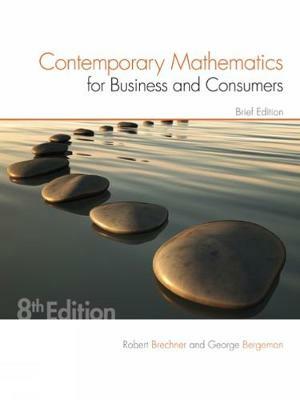 Overcome your math anxiety and confidently master key mathematical concepts and their business applications with Brechner/Bergeman's CONTEMPORARY MATHEMATICS FOR BUSINESS AND CONSUMERS, BRIEF 8E. Refined and enhanced over eight editions, this text continues to incorporate a proven step-by-step instructional model that allows you to progress one topic at a time without being intimidated or overwhelmed. This edition offers a reader-friendly design with a wealth of engaging learning features that connect the latest business news to chapter topics and provide helpful personal money tips. You will immediately practice concepts to reinforce learning and hone essential skills with more than 2,000 proven exercises. Jump Start problems introduce each new topic in the section exercise sets and provide a worked-out solution to help you get started.